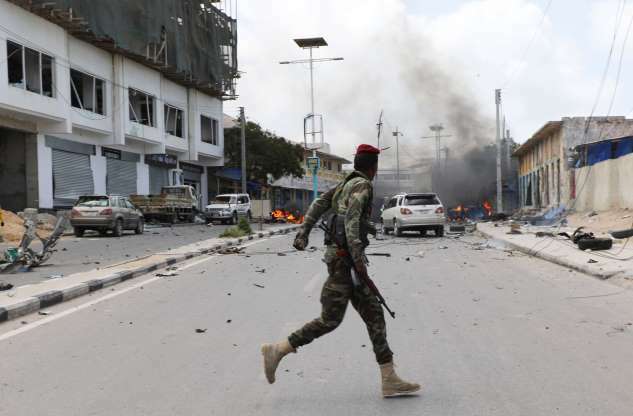 A Somali military officer runs to secure the scene of a suicide car bombing near Somalia's presidential palace in Mogadishu, Somalia July 7, 2018. A least nine people were killed in an attack on Somalia’s interior ministry and security forces killed all three attackers after a two-hour gun battle inside, police said Saturday, as the al-Shabab extremist group claimed responsibility. A number of people, mostly government workers, had been trapped in the ministry on what had been a normal business day. Witnesses said some staffers died or were injured while leaping from windows or walls in an effort to escape. More than 10 people were wounded and the death toll could rise, Col. Ahmed Mohamed said. [post_ads]The attack began in the morning when a suicide car bomber detonated at the gates of the interior ministry compound, which is close to the presidential palace and parliament headquarters and also holds the security ministry, police Capt. Mohamed Hussein told The Associated Press. Dozens of people eventually were rescued in the operation, Hussein said, as ambulance sirens echoed and soldiers opened fire to disperse bystanders and motorists.